Few men’s hairstyles look just as magazine cover-worthy today as they did in the 1950s. Sure, the buzz cut was floating around then, and the slick side-parting’s been a mainstay for even longer, but the quiff? No men’s hairstyle is as steeped in style. Sported by some of history’s most stylish men – from Marlon Brando then, to David Beckham today – the quiff started as a hybrid of the pompadour and 1950s flat top. Since then, it’s proven itself a versatile classic for men intent on making a statement up top, able to be adapted easily whether you’re gearing up for date night or delivering a client presentation. 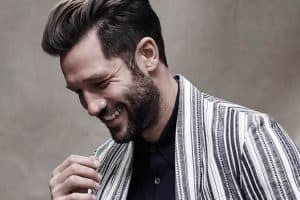 Check out some of the best men’s quiff styles below, and for more on sculpting one – from the cut you need to the products to perfect your finish – take a look at our complete guide to the quiff. Cillian O'Connor is a freelance writer, editor and consultant, best known for his ability to sort the wheat from the chaff in the world’s of men's style, grooming, lifestyle and design. Once named the No. 1 Blogger by Vogue, Cillian also contributes to The Sunday Times, The Business of Fashion and Metro.